The origin of the world's life, time, and space are kept in balance by three wise men called Sages, in Lapenta. But dark forces (Balrog is shown) have broken the balance and put the world in crisis! Empress Ereb and the Sages, as well as many heroes tried to fight them but they could not win, so the Sages sacrificed themselves to seal away the power of darkness in Lapenta. Together with Empress Ereb and the heroes who fought with her, fight to protect Lapenta! Use your arrow keys to move around and climb ladders &lt;C&gt; is used to jump, &lt;Spacebar&gt; allows you to talk to NPCs and use portals, &lt;Z&gt; is to loot Items are required to be picked up but mesos are looted automatically. Defense reduces damage taken when enemies hit you Physical resistance is a new stat that reduces damage taken from physical attacks (additionally to defense), it can be raised by STR and DEX Magical resistance is the same, except it reduces damage taken from magic attacks, it can be raised by INT Avoidability returns and gives a chance to completely ignore the damage of an attack, it can be raised by LUK Critical resistance reduces damage taken from critical hits (by bosses and in PvP) . There are three types of skills: active (which use SP), passive, and action (which use EP) To learn skills, you must get to certain levels There is no more SP (skill points), but instead you use Crystals to level up your skills. Items have ranks: Normal (white), Rare (green) and Elite (blue) Each item is also given a star rating, normal has 1, rare has 2, and I guess elite has 3. The boss raid against Griffon was said to be really fun! As its HP got lower, its battle patterns changed. And sometimes it starts to charge up a flying attack that will do massive damage, but if enough people climb on to it using the &lt;spacebar&gt;, it will cancel the attack! If you die, you are revived in a nearby place with an Eagle that can take you quickly back to the boss as well as an NPC that cures the curse that is put on you (your HP and SP are reduced if you die) Boss item drops will be instanc ed . ~ When you enter the water, a ducky tube will automatically be equipped. ~There is an auction house available to sell your items to other users. 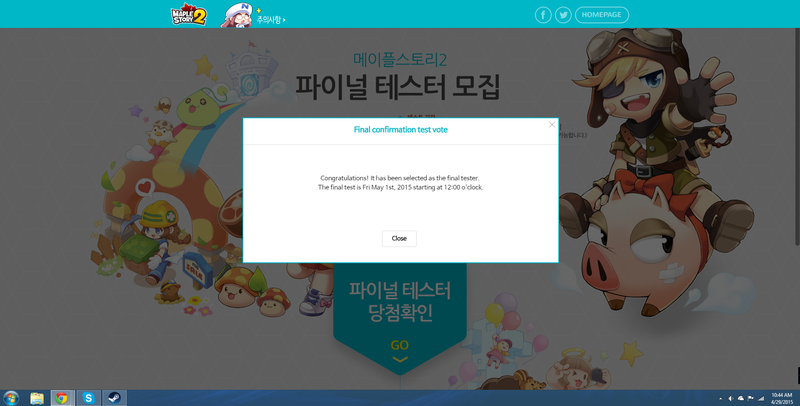 ~ The Trophy system is the achievement system of MapleStory 2, such as walking a certain amount or picking up a certain amount of mesos. ~ Minigames will randomly begin in various maps at different times. ~ Hair and eye customization will be similar to MapleStory in some ways, with an NPC to give you a random hair and one that lets you select a hair. ~ Parties can now hold 10 people. ~ The current time and your mesos will be displayed in the top left. ~ Potions that instantly heal you have a cooldown, but herbal potions that heal you over time do not. Does it mean i got in? I hope so. Does anybody want to start a new character together? Don't like Bandit that much. Did someone can share an account with me ? I didn't get in, i can't wait to play this game, if anyone want to share me an account it would be awesome, message me, then skype.